The Richmond Jewish Day School (RJDS) is a school that loves to donate to charity. 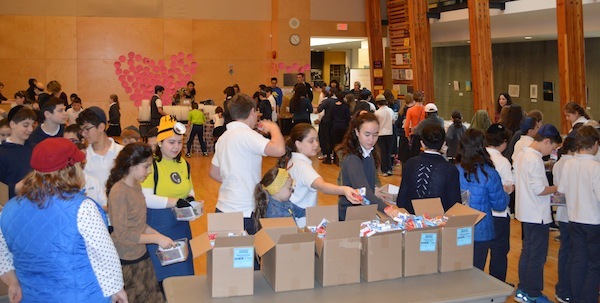 The school currently donates to several organizations, including the Regional Animal Protection Society, the Jewish Food Bank and Variety – The Children’s Charity. 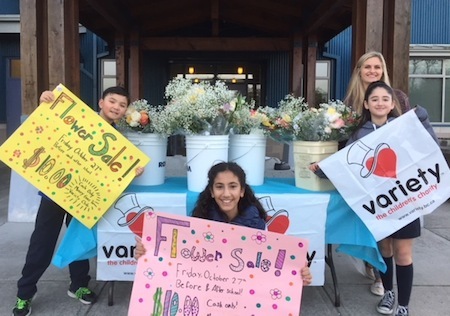 A total of $1,150 was raised this school year for Variety, through flower sales, bake sales and non-uniform days (where students donate a dollar for the privilege of not wearing a uniform). 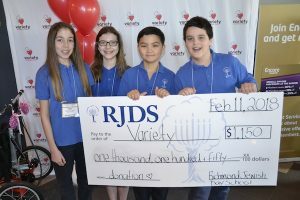 As a result, RJDS received an invitation to be on the Variety Show of Hearts telethon on Feb. 11 to formally donate the money that the student council raised. Several students and a few teachers went on TV and everyone was so excited to be part of such a great experience. For me, the telethon was very inspiring in many ways. There were many people there whose stories were told, and they made me and the rest of student council even more pleased that we could donate. There were many other donations given, as well as ours, that I am sure will make a big difference in some lives. It was amazing to see how much Variety impacts the lives of children and how happy it can make them. Haylee Topp is a Grade 7 student at Richmond Jewish Day School. Editor’s note: This year’s Variety Show of Hearts raised almost $5.5 million, which will benefit children with special needs and their families. Also appearing on the telethon was ShowStoppers, a group founded by Perry Ehrlich and Simon Isherwood that started out as Sound Sensation; the group’s first performance was on the telethon 25 years ago. Those who missed this year’s Show of Hearts can still make a donation online at variety.bc.ca, by calling 604-310-KIDS or by texting “KIDS” to 45678 to make an automatic $20 contribution. The Richmond Jewish Day School student council started three years ago. While there used to be elections, as of this year, any Grade 6 or 7 student can join, and we’re now called the student council committee. 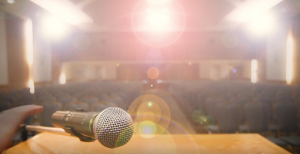 From its very beginning, the committee has done fundraisers for charities, such as the Richmond Animal Protection Society, the Jewish Food Bank and Variety – The Children’s Charity. Many of the students at RJDS agree that giving and helping means the world to us, and a lot of students at our school, including members of our committee, have given to various causes. In past years, we have done bake sales, non-uniform days and flower sales in support of charities. Most recently, we did a highly successful flower sale in front of our school – we sold every single bouquet, and we were interviewed by Global TV. Our goal was to raise $1,049 in support of Variety to help purchase a Sunshine Coach, and the goal was surpassed fairly quickly. We wanted to raise money for Variety because of what they do for children who are less fortunate and need medical attention. Our fundraising will hopefully make a difference to these kids, and put smiles on the faces of some of those in need. Shai Rubin is a Grade 7 student at Richmond Jewish Day School. Because of their efforts, RJDS students will appear on the Variety telethon Feb. 11, between 1:30 and 2:30 p.m. The telethon is a daylong broadcast on Global BC. The day before Yom Kippur, Richmond Jewish Day School students in grades 2 and 5 went to Garry Point Park to do Tashlich. The students learned about why Jews have this custom, and listened to a story about teshuvah (repentance) from Moreh Abba (Brodt). They then sang Avinu Malkeinu together and had two students recite the Tashlich prayer for everyone. The students were given breadcrumbs to throw in the water, symbolizing the getting rid of sins. Chaya Malul is a Grade 5 student at Richmond Jewish Day School. Class representatives were then chosen by teachers and students. Since then, the council has gone from handing out hot chocolate at recess to coordinating an impressive fundraising program. To raise funds, students sold flowers, including gerbera daisies and roses, for local families’ Shabbat tables. 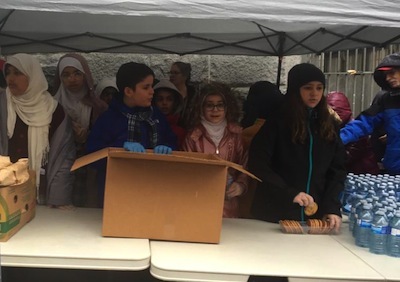 They also sold cakes and contributed $2 on non-uniform days, which take place monthly on Rosh Chodesh, to raise funds for Variety. The students had a chance to meet Heartly, Variety’s mascot, and were shown a video by Richard O’Shaughnessy, Variety’s events coordinator, about a young man who has benefited greatly from the generosity of Variety supporters. Born with only one hand, Drew now has a robotic hand, which allows him to complete even the most intricate tasks. His passion is making jewelry and, thanks to the robotic hand, he is now able to operate the tools required to do so. The RJDS kids watched the video in rapt attention, exclaiming “Cool!” when they heard about the “bionic” hand from Blank. Asked how this fundraising program contributes to the students’ academic programs, Brodt described the integration of the school’s Jewish studies with the government-mandated B.C. curriculum. “It was the perfect way to teach tikkun olam, to bring beauty to Shabbat tables and bring beauty to the wider world. It’s the perfect way to tie what’s out there in the world with what’s in here,” he said, putting his hand on his heart. Blank took the time to answer questions from the group assembled, bringing the kids’ attention back to familiar experiences. He also reminded them to help kids in wheelchairs feel included when they meet them at playgrounds. “They don’t just want help, they’re just like you, they want friends,” he said. It was just shy of a sellout crowd on April 22 at the Chan Centre for the Performing Arts, as Israeli rock pioneer Micha Biton headlined the community’s main celebration of Yom Ha’atzmaut. As it does every year, the evening began with the conclusion of Yom Hazikaron, led by Geoffrey Druker. 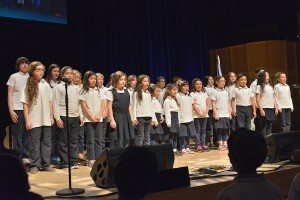 In the singing of the national anthems, Vancouver Talmud Torah Choir was joined by Partnership2gether twin school Alei Givah Choir in Kfar Giladi (by video) for O Canada, while Richmond Jewish Day School Choir and Partnership2gether twin school Hameginim Choir in Kiryat Shmona (by video) sang Hatikvah. Diane Switzer, board chair, Jewish Federation of Greater Vancouver, which led the celebration supported by some 50 community partner organizations and countless sponsors and volunteers, spoke briefly. She provided an overview of how the funds raised here for our partnership region in Israel – Eztabah Hagalil (the Galilee Panhandle) – are spent. “Our Gesher Chai (Living Bridge) program aims to deepen connections with Israel on a person-to-person basis,” she said. “It builds lasting ties between our two communities, and is a cornerstone of Jewish Federation’s work. “Through Gesher Chai, we help local day school students build enduring relationships with their peers at their sister schools in Israel. We fund exchanges between local educators and their Israeli counterparts so they can develop a shared curriculum. And we help connect the JCC Or Chadash dancers you’ll see tonight with the Hora Goel dancers from our partnership region. 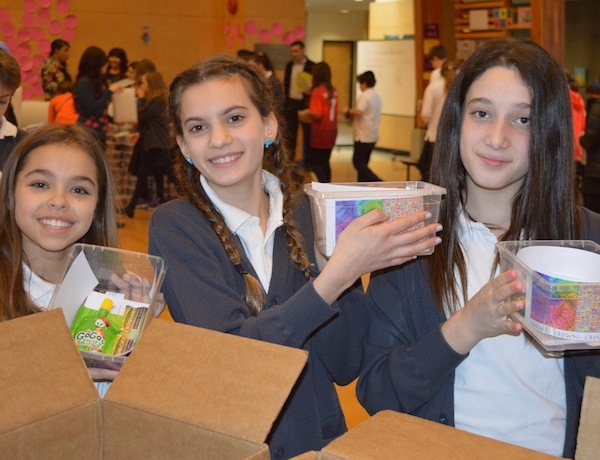 The impact of these programs, which promote Jewish identity and unity for elementary and high school students, can be felt around the world and here at home. 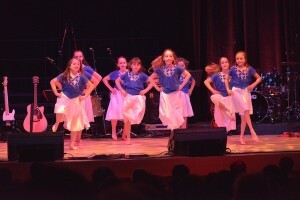 Warming up the crowd before Biton’s performance was the Or Chadash dancers. The evening also included greetings by video from Premier Christy Clark, as well as from mayors Benny Ben Muvchar (Mevo’ot Hermon), Giora Saltz (Galil Elyon), Rabbi Nisim Malka (Kiryat Shmona), Ilan Or (Yesod Hama’ala) and Herzel Boker (Metula).